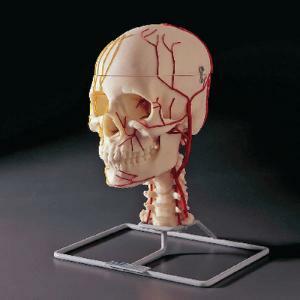 A life size adult skull, horizontally sectioned with removable vault, made from a unique specially formulated plastic with the look and feel of real bone. This material allows reproduction of fine anatomical detail to the most exacting requirements. The mandible has full dentition. The vault lifts to expose all the internal features of the cranium. The separate skull bones are clearly shown and meticulous molding distinguishes such detail as the fine bones of the nasal concha, internal carotid artery canal and full size styloid processes. All the detail shown including foramina, nerve grooves etc. The arteries are shown on one side and nerves on the other. Removing the vault exposes the main nerves and arteries on the floor of the cranium. The 12 cranial nerves and the distribution of their branches is also shown.